The third annual In the Market for Blues Festival, the OEAA Summer Showcase, reunions for iconic music mainstays The Drumstick and The Ranch Bowl and a great roster of touring acts at clubs keep August full of great music choices. August kicks off with an expanded celebration of blues in the Old Market. In the Market for Blues happens Saturday, Aug. 5, in eight venues around Omaha’s Old Market. The third annual event, launched by Hector Anchondo and E3 Music Management, is joined by new sponsors this year including the Blues Society of Omaha, the Central Iowa Blues Society, Shucks Fish House & Oyster Bar, Paul Gerber Auto Sales and Flagship Restaurant Group. P articipating venues include Harney Street Tavern, The Hive, Dubliner Pub, Bourbon Saloon, Jazz a Louisiana Kitchen, Havana Garage, The Omaha Lounge and T Henery’s. A $10 wristband gives you admission to all the venues. Youth under 21 years old are permitted at most venues until 9 p.m. with an adult. National touring acts include Tas Cru & His Band of Tortured Souls and J.J. Thames & the Violet Revolt. All together, over 25 local and regional bands are scheduled to perform. See the full schedule and all the details at facebook.com/InTheMarketForBlues and mark your calendars to support this home-grown blues festival. The Thursday blues shows continue 6-9 p.m. at Chrome Lounge with the BSO Presents series. Thursday, Aug. 3, brings the return of high-energy Blinddog Smokin’, a band that was Grammy nominated for their work with Dr. John and Bobby Rush . Thursday, Aug. 10, is a double bill with the Harliss Sweetwater Band and the Jimmy Thackery Band. The Lucky Losers are up Thursday, Aug. 17. The SFCA area band, featuring Cathy Lemons and vocalist/harmonica man Phil Berkowitz, has been a recent favorite of Mike Jacobs’ “ Blues in the Afternoon” playlists on Omaha’s KIOS, 91.5 FM. They are also nominated for two 2017 Independent Blues Awards. Ruf Records’ guitarist Albert Castiglia is up Aug. 24. Rock and soul legends The Cate Brothers don’t play out very often but they like playing Omaha. They return Thursday, Aug. 31. Be on the lookout for Laura Rain & The Caesars Thursday, Sept. 7 with a new CD in hand. Lincoln’s Zoo Bar keeps the great bands coming in August. Vocalist Gina Sicilia is featured Tuesday, Aug. 8, 6-9 p.m. Guitar star Jimmy Thackery plugs in Wednesday, Aug. 9, 6-9 p.m. Cate brother Earl Cate brings Earl & Them to the stage Friday and Saturday, Aug. 11 and 12. Friday, Aug. 11, Earl & Them share the stage with The Bel Airs for a “Super FAC” (that’s Friday Afternoon Club, for those who don’t know). Danielle Nicole Band is up Wednesday, Aug. 16, and Chicago legend and former Magic Slim sideman John Primer rocks the house Wednesday, Aug. 23. Both shows 6-9 p.m. The annual OEAA Summer Showcase moves to the Blackstone District for performances Friday, Aug. 11. There will be over 40 bands plus comedy and art on tap at seven venues. See facebook.com/oeaawards for details. The online public nomination submission period for the 12th Annual OEAAs ends on August 31, 2017. Vote now for your favorites at vote.oea-awards.com. The Depot Deli in nearby Shenandoah, Iowa, is a favorite restaurant for locals and also a grassroots music venue presenting world-class artists thanks to owner Bill Hillman‘s interest in good music. Hillman has booked legendary U.K. guitarist Albert Lee for one of Lee’s only Midwest tour stops at the Depot Deli Saturday, August 12, 7 p.m. See albertlee.co.uk and depotdeli.com. Lee plays a street dance to benefit the Wabash Trace Nature Trail. Lee is a guitarist’s guitarist who was influenced by early American rockabilly and blues. After extensive professional work in the U.K., he went on to play with Buddy Holly’s former band The Crickets, then worked with Don Everly, Joe Cocker, Emmy Lou Harris and The Hot Band, and Eric Clapton (on Just One Night and the tour that followed). While pursuing a solo career he also played with the Everly Brothers reunion, worked with Bill Wyman in his band The Rhythm Kings and performed alongside Eddie Van Halen and Steve Morse in the supergroup the Biff Baby All-Stars. Lincoln music fans remember The Drumstick, part family fried chicken restaurant and part iconic capital city music venue. The number of now very influential or famous artists who played The Drumstick is too long to list. Look it up. 2017 marks 30 years since the music venue closed. Gray’s Keg Saloon, 104 N. 20th in Lincoln, hosts a Drumstick Reunion featuring Charlie Burton & Or What Friday, Aug. 18, 6-8 p.m. Venue owner Tim Lohmeier’s sister, Catherine Lohmeier, is working on a documentary about the memorable club. See gofundme.com/remember-the-drumstick. Sunday Roadhouse hosts Motel Mirrors at Reverb Lounge Sunday, Aug. 6, 5 p.m. The project features Amy LaVere and Will Sexton. See sundayroadhouse.com. Waiting Room offers a Ranch Bowl reunion weekend Aug. 25-26 with local favorites. See onepercentproductions.com for more on this show and lots of great shows coming up at Waiting Room including X Monday, Sept. 11, Lucero Wednesday, Sept. 20, and James McMurtry, Wednesday, Nov. 15. One Percent also hosts Spoon and Twin Peaks Sept. 11 at Sokol and Wilco Friday, Sept. 22, at Lincoln’s Pinewood Bowl. Local favorites the OK Sisters have a long-overdue Omaha gig Saturday, Aug. 12, 8 p.m. Vox Combo also plays in the show at Barley Street Tavern. Power-pop artist Dwight Twilley has a gig at Growler USA Saturday, Aug. 19, 9 p.m. The Chicago Tribune calls The Claudettes “a revelatory blend of jazz and blues, stirred with punk brio.” The band plays O’Leaver’s Thursday, Aug. 17, 9 p.m., with Soul Tree and Anonymous Henchmen. 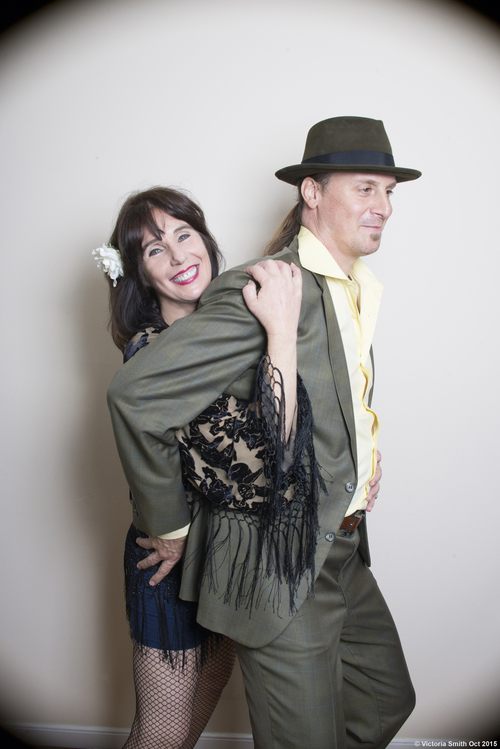 San Francisco bay area blues vocalist Cathy Lemons and vocalist/harmonica man Phil Berkowitz front The Lucky Losers. They perform at BSO Presents at Chrome Lounge Thursday, Aug. 17, 6-9 p.m. The Lucky Losers, photo by Victoria Smith.